This 4-6-0 “Ten-Wheeler” steam locomotive was owned by the Southern Pacific Railroad, and operated on the San Diego & Arizona Railroad. It was built by Baldwin in 1912, and weighs 104 tons (loaded). It’s drive wheels are 63” in diameter, and it has 22” x 28” cylinders. In 1917 it was given a new boiler made by ALCO. The “Vanderbilt” style tender weighs almost 45 tons and carries 12,000 gallons of water and 4000 gallons of fuel oil. 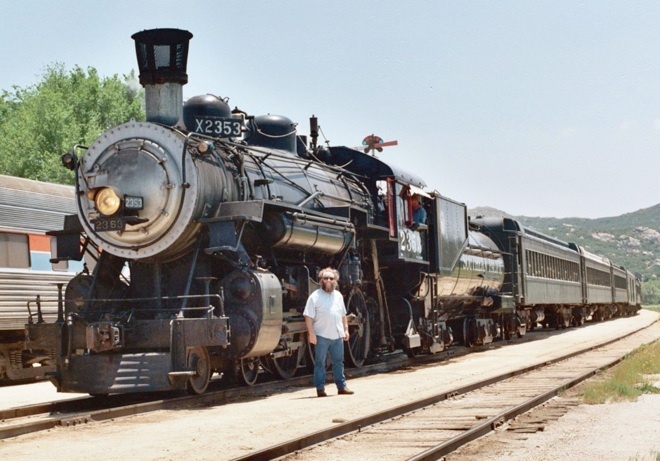 #2353 was displayed outdoors at the Imperial Valley fairgrounds for many years before being acquired by the Pacific Southwest Railway Museum and moved to Campo. The museum eventually restored it to operation and ran it for several years in the 1990s. It is currently out of operation and in need of a new boiler. The photos here were taken sometime in 1998 or so.